Do you dream of being a great photographer but don't have enough time to learn everything? To be a great photographer today there are so many different things to learn. It can be overwhelming! The jobs that used to belong to lab technicians, marketers, web designers and business managers now belong to you! It is hard to make progress in the limited time you have available when you are pulled in so many different directions. How far down each path you should go? 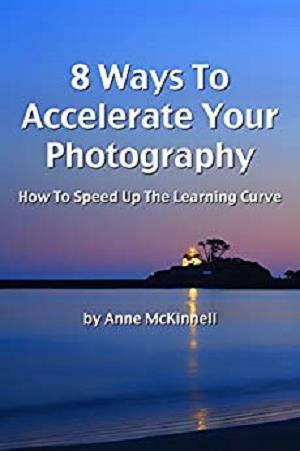 Written by Canadian Pro Photographer and Author Anne McKinnell, "8 Ways To Accelerate Your Photography" identifies 8 core knowledge areas that are essential for today's photographer and shares the quickest and most effective techniques in each area so you can accelerate your learning curve. Learn the quickest and easiest techniques in each of the 8 core knowledge areas to jump start your photography! This eBook is easy to digest and explains the concepts without using "techno-lingo." In 4 years Anne went from buying her first DSLR to having a large audience online, a popular and successful blog, and images in and on the cover of magazines and photography books. Now a full-time nomadic photographer, Anne travels around North America practicing her photography skills and experimenting with different techniques. She has explored the land as well as the vast array of skills you need to become a photographer today. In this eBook she shares those skills with you so your rise to photography success will be even faster. You need each piece of the puzzle. Perhaps you're not an amateur photographer but you don't know how to get a website going and build an audience. Or perhaps you are marketing wiz but you don't know how to use your camera. To be successful as a photographer today you need all the pieces of the puzzle to fit together. Don't leave great photographs for some day! 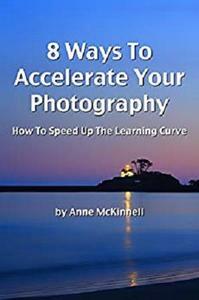 "8 Ways To Accelerate Your Photography" features a collection of 72 inspiring photographs and 17,500 words of great tips and insight. UPDATE: This deluxe edition of the eBook has 35 additional photos!